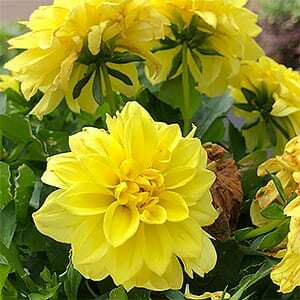 Low growing or dwarf dahlias offer a number of solution to gardeners. They grow well in pots or planter boxes, you can use them mass planted the garden border or even a hanging basket. 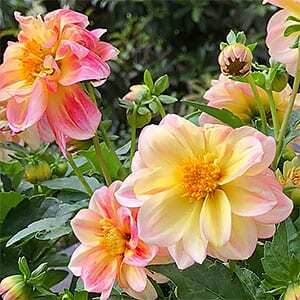 So what are dwarf dahlias ? Simply lower growing varieties of their larger relatives. They like the same conditions and once established are a fairly hardy plant. Here we are talking about varieties that will reach around 30cm and spread to a similar size. They come in a range of flower forms and colours and are easy care. These are tuberous rooted perennials and will need to lifted to survive winter in most areas. You can also grow them from seed and treat them as an annual. Seed is available for sale online from a number of suppliers. Growing in the ground requires a humus rich well drained soil and good morning sun. In to much shade they will be reluctant to flower. Potted plants can be transferred to the garden and watered in well with a liquid seaweed fertiliser. Tubers are planted at around 10cm (4 inches deep). Space them at around 20cm for mass planting. Regular watering during active growth will provide better flowering. A liquid fertiliser applied every two weeks will also help. New plants from tubers can be pinched back early on in the growth cycle to obtain a more bushy plant.